Preface. Editorial Board. List of contributors. 1. Biochips beyond DNA: technologies and applications (J.H. Ng, L.L. Ilag). 2. Nonribosomal peptide synthetases as technological platforms for the synthesis of highly modified peptide bioeffectors - cyclosporin synthetase as a complex example (T. Velkov, A. Lawen). 3. Horseradish peroxidase: A valuable tool in biotechnology (A.M. Azevedo, V.C. Martins et al.). 4. Considerations for the planning and conduct of reproducibility studies of in vitro diagnostic tests for infectious agents (T. Derion). 5. Clinical trial methods to discover and validate predictive markers for treatment response in cancer (S. Paik). Production of high-quality marketing applications: Strategies for biotechnology companies working with contract research organizations (S.J. Hecker, C. Preston, M. Foote). 7. Use of benchmarking in the development of biopharmaceutical products (M. Giffin, S. McLeish). 8. The state of biopharmaceutical manufacturing (D.T. Molowa, R. Mazanet). 9. Review of current authorship guidelines and the controversy regarding publication of clinical trial data (M. Foote). 10. Protein electrostatics. A review of the equations and methods used to model electrostatic equations in biomolecules. Applications in biotechnology (M.T. Neves-Petersen, S.B. Petersen). 11. The development of supportive care agents for patients with cancer (T.K. Neumann, M. Foote). Index of authors. Keyword index. It is an exciting time to follow the new developments in the field of biotechnology and its wider applications in the different areas. The whole genomes of over 1000 viruses and over 100 microbes can now be found in Entrez Genome. The genomes represent both completely sequenced organisms and those for which sequencing is still in progress. The three main domains of life - bacteria, archaea, and eukaryota - are represented, as well as many viruses and organelles. The exponential increase of the sequence data lead to the development of the new "Bioinformatics" field in order to attempt making sense, at least biological sense, out of all the new and fast data. It will take also other techniques such as "functional genomics" to link the gap between a specific phenotype or a treatment and a gene sequence. Functional genomics tools are therefore important for the accurate molecular diagnosis/prognosis, target discovery validation needed for drug development and novel targets for antibiotics development. Functional genomics are also important for the confirmation of therapy in pharmacogenomics studies. Biotechnology is in many respects shaping our life and affecting our means of production and the creation of jobs. Progress in the applications of biotechnology depends on a wide base of basic as well as applied sciences. The output of biotechnology has already proved itself in many diverse fields from health to biomining and from agriculture to enzyme "breeding". It is therefore difficult to follow all of the current as well as the potential applications of biotechnology. 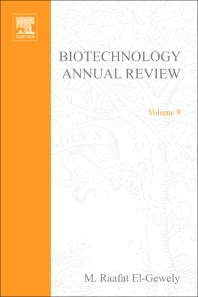 The objective of the Biotechnology Annual Review series is to attempt to provide readers with the needed indepth knowledge, by reviewing specific topics in biotechnology in each issue. The philosophy behind this series is to encourage good reviews to make it easier for readers to keep in touch with progress and applications of biotechnology. Reviews on topics related to regulatory affairs, social impact of biotechnology, biodiversity, biosafety, public acceptance and patent issues are also encouraged.